A few weeks ago, the UK Home Office rejected an Afghan Sikh family’s application for asylum partly because they couldn’t find any “assessment or tests” to confirm they were Sikh, even though the family had a letter of support from their local Gurdwara. The incident left academic Dr Jasjit Singh fuming. “This is ridiculous. Since when has @ukhomeoffice required congregations to complete tests to confirm their religious adherence? And why aren’t letters of support from Gurdwaras enough?” – he tweeted. “This is such a colossal waste of time and resource thanks to religious illiteracy around minority ethnic religions,” he added. He had good reasons to be annoyed. Afghan Sikhs applying for asylum into the UK face major barriers including having to prove they are Sikh. It’s generally assumed they all speak Punjabi, know Sikh history and keep long hair, he told Barfi Culture. But many don’t speak Punjabi as their mother tongue and some do cut their hair often after facing threats and discrimination. This “religious illiteracy” means many Sikhs genuinely fleeing persecution from extremists in Afghanistan are rejected by the UK Home Office even if they have a legitimate case. In late June a devastating terror attack on Sikh and Hindu leaders in Afghanistan sent shockwaves through the community. It also illustrated the dangers that religious minorities face in Afghanistan. Around 700,000 Hindus and Sikhs are estimated to have lived in Afghanistan in the 1970s, many say that number is down to less than 3,000. Canadian Sikh groups have been loudly calling on their government to offer asylum to more Afghan Sikhs, though the response has been muted. A similar call is being made by British Sikh groups. “Afghan Sikhs we’ve spoken to in London have told us it is now time for Sikhs to leave Afghanistan and seek sanctuary elsewhere,” says Lord Singh from the Network of Sikh Organisations. Dr Jasjit Singh, a Research Fellow at the University of Leeds, has been repeatedly called in by lawyers representing Afghani Sikhs asylum seekers to help with their claims. “I’ve interviewed the claimants to establish their ‘Sikh-ness’ using my knowledge of the Sikh tradition. Rather than relying on text book representations I’ve asked them about their ‘lived’ Sikh practices,” he told Barfi Culture. But there are several cases where the Home Office has rejected applicants out of ignorance, after referring to sources with factual errors like this one at the WSJ. Only last week it changed guidelines accepting that Afghan Sikhs and Hindus may also speak Pasto, Dari or Kabli as their primary language. He stresses that the UK government does the same with Christian and Muslim who are fleeing religious persecution so Sikhs are not being singled out. But ignorance about the faith and its adherents has made it harder for Sikhs. So how could other British Sikhs help? 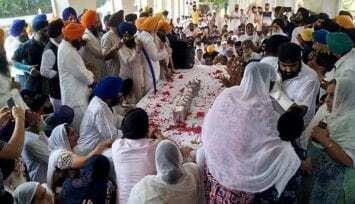 KEERATPUR SAHIB—The ashes of 12 deceased Afghan Sikh leaders and a Hindu leader were immersed in a tributary pouring into the Nangal Hydel Channel at Gurdwara Patalpuri Sahib in Keeratpur Sahib on July 23. The ashes were brought from Gurdwara Guru Arjan Dev Ji of New Mahavir Nagar (Delhi) where these were being kept for glimpse since July 19. 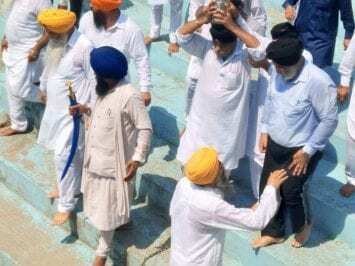 SAD leaders Dr. Daljit Singh Cheema and Bhai Amarjit Singh Chawla paid homage to the departed Afghan Sikh leaders while immersing their ashes in a tributary pouring into the Nangal Hydel Channel at Gurdwara Patalpuri Sahib. The SGPC had made robust arrangements for the relatives of deceased Afghan Sikh leaders at Gurdwara Keeratpur Sahib on this occasion. Former Cabinet Minister Dr. Daljit Singh Cheema said on this occasion that the Shiromani Akali Dal understands the pain of Afghan Sikhs and is committed to help them in every possible way. He also prayed for the spiritual relief of departed Afghan Sikh leaders. 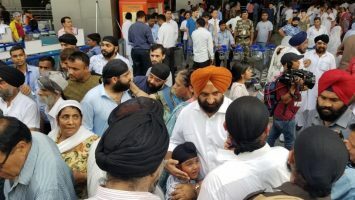 It may be recalled here that the ashes of 12 Afghan Sikh leaders and a Hindu leader, who were killed in a suicide bomb attack on July 1 in Afghanistan’s eastern town Jalalabad, were brought to India in a special air ambulance on July 19. Beside it, the six injured Sikhs were also brought to India for providing them ailment at the All India Institute of Medical Sciences, New Delhi. 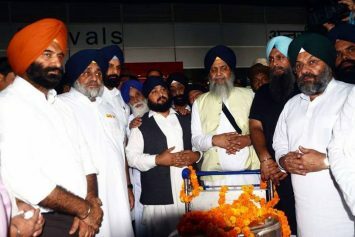 NEW DELHI—The ashes of Afghan 12 Sikh leaders and a Hindu leader, who were killed in a suicide bomb attack on July 1 in Afghanistan’s eastern town Jalalabad, were brought to India in a special air ambulance on July 19. Beside it, the six injured Sikhs were also brought for providing them ailment at the All India Institute of Medical Sciences, New Delhi. 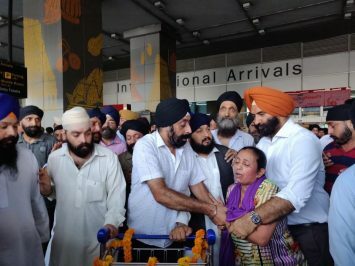 Grief stricken Afghan Sikhs enshrined in India received the ashes and injured Sikhs at Indira Gandhi International Airport (Delhi) along with SAD president Sukhbir Badal, SGPC president S. Gobind Singh Longowal, DSGMC president S. Manjit Singh GK, DSGMC general secretary S. Manjinder Singh Sirsa and other leaders on this occasion. Sikh24 has learnt that the ashes of Afghan Sikh leaders will be placed at Gurdwara Guru Arjan Dev Ji in New Mahabir Nagar (Delhi) for two days and then will be submerged at Gurdwara Kiratpur Sahib in Punjab. With the help of Indian Foreign Ministry, a special arrangement has been made for the treatment of injured Afghan Sikhs at AIIMS. It may be recalled here that 12 Afghan Sikh leaders, including the upcoming parliamentarian S. Avtar Singh Khalsa was killed in a suicide bomb attack at Jalalabad on July 1. Even after three weeks of the incident, there is no clarity about the perpetrators of this inhumane carnage. Initially, it was being suspected that the ISIS committed carnage of the Afghan Sikh leaders, but later, unconfirmed reports had surfaced over social media that the land mafia orchestrated the attack on Afghan Sikh leaders with an eye on the land owned by the Sikh shrines there. 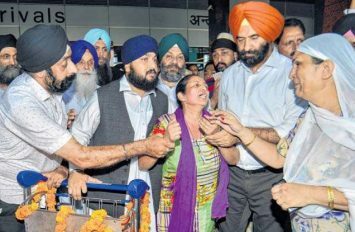 Ludhiana (Punjab), July 19: Over the years, hundreds of Sikh minorities of Afghanistan have fled to India owing to atrocities meted out on them by Islamic fundamentalists and Islamabad-backed insurgent groups. These people, who are given second class treatment in Afghanistan, have not been able to find shelter but they are leading a safe and respectable life in India owing to extensive assistance package provided to them by the Indian government. Since the situation has not shown any improvement with time, these people are reluctant to go back to the war-torn country. While narrating his tale of plight, Shami Singh, an Afghan migrant who has been living in India for quite some time now says it was the regular torture and repeated threats of converting to Islam that forced him to come to India. It is not just the government but the Sikh religious bodies have also been instrumental in enhancing the lives of the migrants. They have been providing regular financial and other support to the needy. Islamabad has been hatching diabolic plots and been carrying out systematic attacks against the minorities in its own country and Afghanistan. In line of the same satanic agenda, few Pak-backed terrorists had carried out a deadly attack in the Nangarhar province of Afghanistan eliminating the top minority leadership of the country. Only weeks ago, a prominent Sikh religious leader Charanjit Singh Sagar was shot dead in Peshawar city of Khyber Pakhtunkhwa province of Pakistan. The minority Sikh and Hindu community in Pakistan remains a frequent target of Pakistani Taliban and secret agencies and the majority of these families have been forced to migrate to Europe and India. Punjab Chief Minister Captain Amarinder Singh on Wednesday wrote to Minister for External Affairs Sushma Swaraj urging her to advise officials in her ministry and the Indian High Commission in Afghanistan to ensure that the minority Sikhs were safe in the war-torn country. In his letter, Singh voiced his dismay at the recent Kabul bombings and growing number of terrorist attacks in Afghanistan, saying that the constant strife in the country have left Sikhs vulnerable. The letter asked Swaraj to “pursue measures” to ensure that violence-hit Sikh families were offered security, relief and rehabilitation. At least 19 people were killed on July 1 in a suicide bomb that targeted a convoy of Hindus and Sikhs who were on their way to Jalalabad to meet Afghan President Ashraf Ghani. Islamic State, whose footprint is growing in the already strife-torn land, claimed the attack.